If you could narrow down what was your number one food you baked in 2016 what would it be? Your favorite tried-and-true chocolate chip cookie recipe? Your favorite overnight French toast? Mine would probably be a tie between 2 things: banana bread and the Pioneer Woman maple cinnamon rolls recipe. Just thinking about either of these two makes my mouth water! The greatest part for us in our family is that these are both egg free for my daughter who is allergic. I’m not gonna lie some of my go-to egg free recipes just are not comparable to regular recipes of the same thing. Take chocolate chip cookies for example. The only egg free chocolate chip cookie recipes I have found turn out like little shortbread hockey pucks with chocolate chips. They could never pass for regular chocolate chip cookies and some people would probably rather pass completely than eat them at all. But to my daughter—they are heaven so we make them anyway! 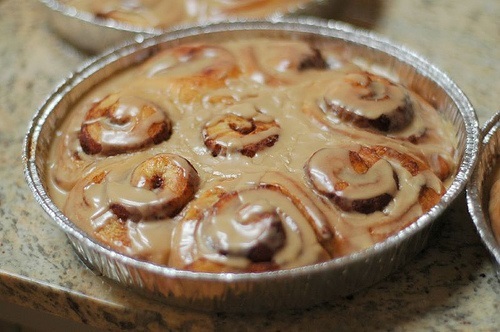 However, these two things, specifically the cinnamon rolls (I mean—Pioneer Woman—hello! Of course her go-to cinnamon roll recipe is divine!) So I can’t wait to share that recipe with you if you haven’t already heard of them—it has been long overdue. When I think about making these two things with my daughter it warms my heart and makes me think about eating so many cinnamon rolls until our stomachs hurt. And always buying oodles and oodles of bananas that I know secretly we could never eat them before they are brown and have to be used for something---oooooh how about yet another batch of banana bread?? Wahoo! Let’s talk about these cinnamon rolls again for another minute. I’ve got to sell you on them. I believe this is one of the Pioneer Woman’s most popular recipes and for good reason. She posted it because it’s the recipe her mom used to make around Christmas time and deliver to all their neighbors. It is a really big batch that makes 7 little pans of rolls, but the great thing about Cook’n is the ease of saying exactly how many you want to make and it will adjust it all for you so you can make a small batch for just your family. It is a soft, fabulous dough and has plenty of butter on the bottom and a lot of the cinnamon and sugar seeps down so it makes the bottom of the cinnamon rolls really delicious. The icing is butter and powdered sugar and some maple extract so it is really unique but is the kind of thing you wonder how you have never had it before and why didn’t you think about it yourself! Anyway, if you have time to squeeze these in and make a batch before your New Year’s Resolutions kick in full swing I would urge you to make these and end off the best way possible!